AP SA1 Telugu Exam Answer Keys with Solutions . Summative assessment SA 1 exam which are going on in AP state Exam which is held in November month in Telugu, Tamil, Urdu, Sanskrit. 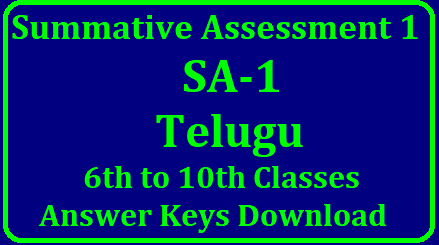 Telugu subject SA 1 Answer key is released in Telugu medium and English medium. Teachers who are handling 6th, 7th, 8th, 9th and 10th class now download the answer paper with solutions and bit paper also.